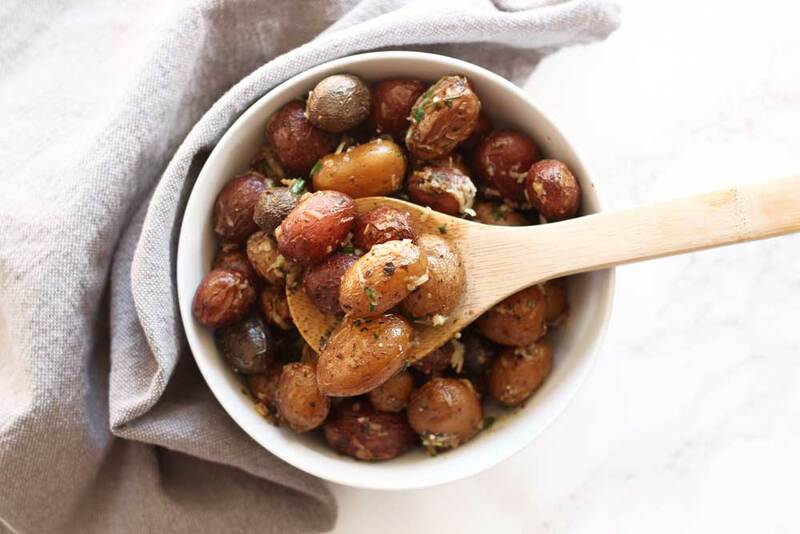 Full of flavor and zest, these Slow Cooker Herb Roasted Garlic Potatoes are one of the most flavorful and easiest side dishes you will ever make! These are perfect for any weeknight dinner and your family will enjoy the tenderness in every bite with these potatoes! I’m heading out of town tomorrow. I’m going to London for work and I’ll be gone a total of 9 days! I’m super excited…I’ve been to London several times, but I always love going back. Hubby will be taking care of the kiddos here while I’m gone, so he’s got a full job on his hands! Everytime I head out of town, I strive to make their lives easier by cooking at least three meals before I head out so they can easily warm things up and eat some home cooked meals while I’m gone. Thank God for freezer meals like Brenda Rowland’s Chicken and Rice Casserole and my Lasagna. Hubby really doesn’t cook all that often. He can definately cool, but it’s not his passion like it is mine. I cook every single night, so we aren’t used to going out to eat a lot. Plus let me be honest… the food I make is just as good as our local restaurants (or better in some cases) so why would I waste money when my food is up to par?!?! I know my food blogger friends know exactly what I’m talking about! 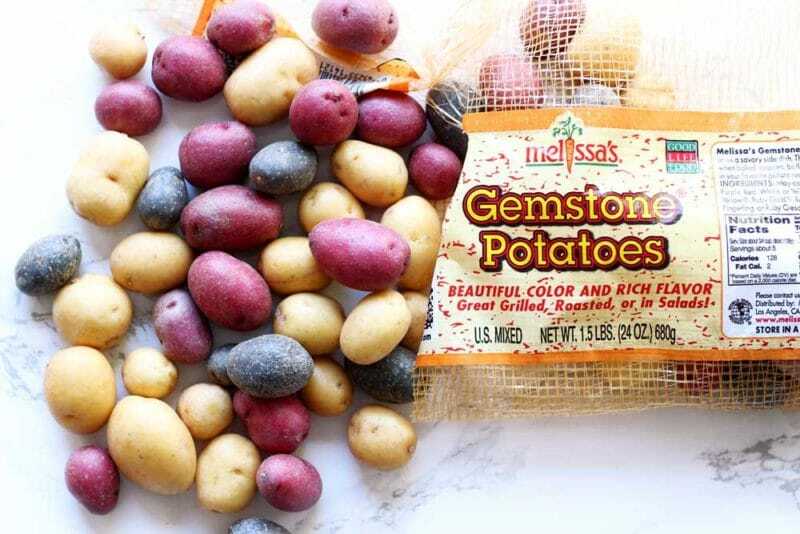 You can use any small potato of your choice for this recipe, but we love these little Gemstone Potatoes! First of all, they are fun and cute! We love the variety and the colors! But my favorite thing about these potatoes are how tender they become when you cook them…especially in the slow cooker! We’re talking velvety smooth! I found these at my local grocery, but you should also be able to find them at your local health food store like Sprouts or Trader Joe’s. Oh my goodness the ingredients in this recipe are out of this world!! I pile on the fresh minced garlic, though. You just can’t have too much garlic in my opinion! I also throw in dried dill, dried oregano, dried Italian herbs and dried basil. Add in some olive oil and some unsalted butter and you have a perfect combination of ingredients to provide you with an amazing taste full of amazing flavor and zest! With this recipe, you literally just throw the potatoes in the slow cooker (wash them first!) and then add in the simple ingredients. Give these jewels a little stir then set your slow cooker to low for about 4 hours and let that slow cooker do its thing!! 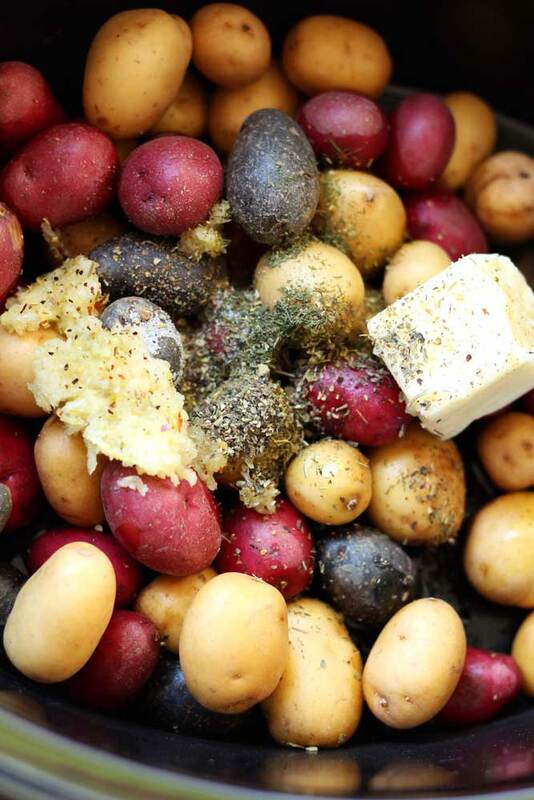 After the potatoes are done, you’ll want to take the potatoes and put them in a mixing bowl. You’ll then add some fresh grated Parmesan cheese and stir so the Parmesan cheese slowly melts while the potatoes are still how. A lot of people like to top their potatoes with fresh parsley, but I prefer chopped chives. Luckily, I have some garlic chives growing in my garden right now, so I finely chopped the chives and sprinkled them on top. The chives mix really well with the garlic and dill, so I really enjoy the taste of fresh chives sprinkled to the top. What Main Dishes Do I Serve With These Potatoes? 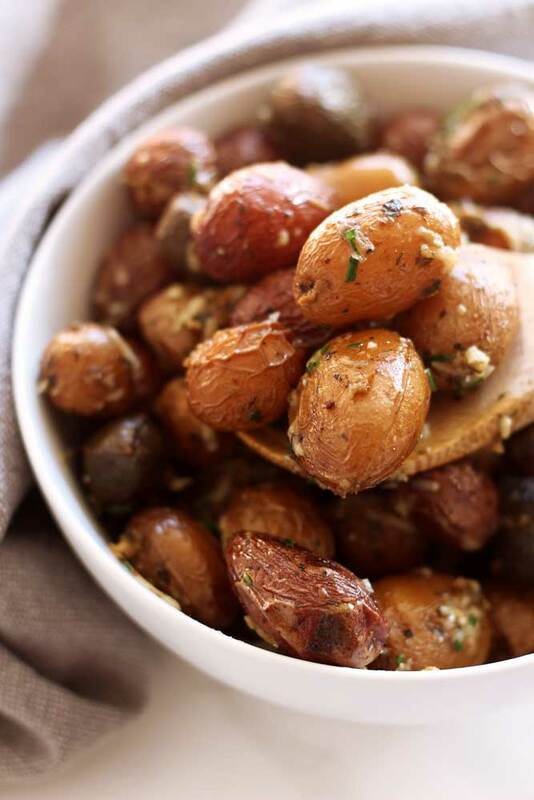 Regardless what dish you serve these Slow Cooker Herb Roasted Garlic Potatoes with, you’re guaranteed to love these! Check these potatoes at 4 hours into slow cooking. You want your fork to be able to slide smoothly into the potato. Make sure you don’t overcook these! If you are going to double the recipe, you have to double the cooking time. Crockpot size – I have a 3 quart and a 5 quart crockpot. As long at the 1.5 pound potatoes fit in your crockpot, your crockpot size should not matter. This is the crockpot I own. You’re going to love these little gems! These will quickly become a family favorite! Happy Eats with this recipe friends! I hope you found this blog post and these step-by-step crazy easy instructions helpful! If you’ve tried these potatoes or any other recipe on the blog, then don’t forget to rate the recipe and let me know how it turned out in the comments below! I love hearing from you! You can also sign up for my newsletter and FOLLOW ME on FACEBOOK, TWITTER, INSTAGRAM and PINTEREST to see more delicious food I’m creating! Wash your potatoes and place in a slow cooker. Add in the olive oil, butter, garlic cloves, dried oregano, basil, dill, salt, Italian seasoning and pepper. Stir all the ingredients so they mix well with the potatoes. The butter should be soft enough to mix well with all the other ingredients and coat lightly. After potatoes are done, stir in the freshly grated Parmesan cheese. Top with the chopped chives. 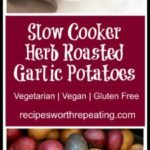 While the potatoes are cooking in the slow cooker, stir occasionally so the garlic herb mixture doesn't stick or burn to the bottom. The 1.5 lb bag of potatoes will take between 4 to 5 hours to get all the way done. I typically cook mine a full 4 hours and they are perfect! Update Notes: This post was originally published in October of 2016, but was re-published with updated step-by-step instructions, pictures and tips in September of 2018. Could I do this with cut up regular potatoes? I’ve not made this recipe with Idaho or Russet Potatoes. You could try using regular potatoes, but I think it would be too starchy. 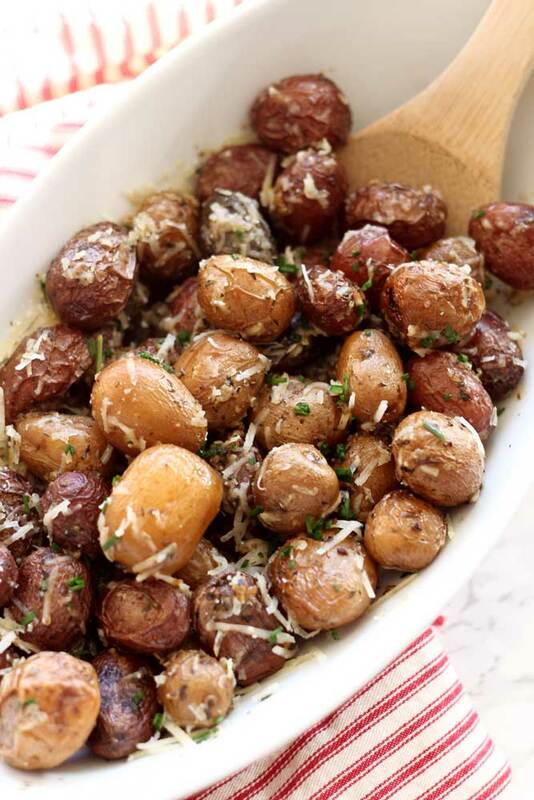 One of my favorite things about this recipe is the velvety texture of the potatoes and you get that from using new potatoes or little gemstone potatoes. 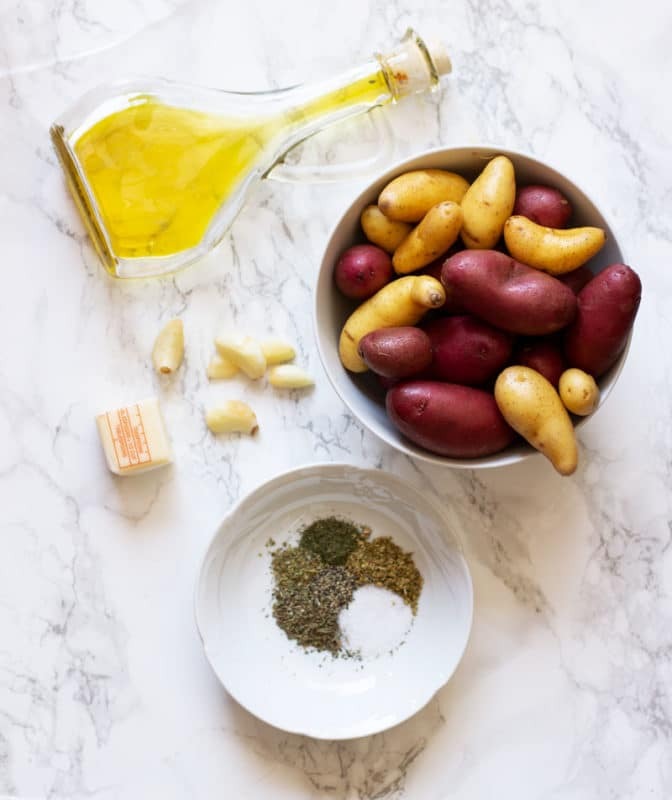 Let me know if you try it out using regular potatoes and how it works for you! I doubled the recipe (3 pounds potatoes) for our Christmas Eve buffet but the potatoes were far from done after four hours. I had to put them on a baking sheet and bake them in the oven. I only had time to leave them in for 25 minutes and they still needed more time. I wonder if adding a small amount of water would help? And I suppose they would need to cook 8 hours or so in the crock pot? I think the idea is great for dinners or buffets with a lot of people because it frees up space in the oven for other things. Yeah – if you are going to double the recipe, you have to double the cooking time. That’s pretty much standard for every recipe. Try again and let me know how it works for you. While these are cooking in your crockpot, make sure you are stirring them and sticking a fork in them about 2 hours before they are done so you can make sure they are done and not overcooked. Sometimes when you double the recipe/double the time…you have to watch things closely to make sure they aren’t overcooked. I love London. Everything is so orderly, clean, and the busses are smack dab on time. I always and welcome enjoy a trip there, although next time in the UK, I think I will want to explore some of the other parts a bit. These potatoes look very tasty, Amanada. I really like these smaller potatoes and look forward to giving this one a whirl! Thanks, Ben!! Let me know how you like them!! They are my biggest catering side dish request!!! My clients love these little gems!! You have give a delicious blend to regular potato. 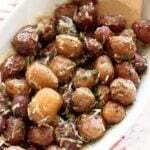 I think you have prepared this recipe from fresh potatoes direct from farm as seasoned potatoes skin become thick.